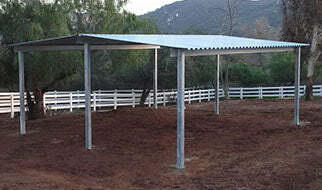 Are you looking to provide shade for your livestock? We have exactly what you need. Our free standing shelters are made with hi-grade materials, and the sheet metal roofing is made from grade zero 26 gauge materials. If you’re looking for just a little coverage, we carry clamp on covers that would give them the shade they need.